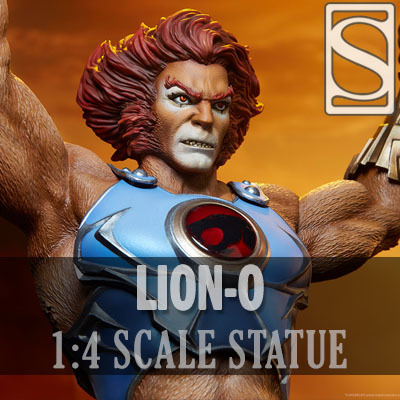 Sideshow is proud to present the Lion-O Statue, the next exciting addition to the ThunderCats collection. Lion-O stands proudly atop a Cats’ Lair inspired base, holding the legendary Sword of Omens high above his head. In the other hand, he wields the intricate golden Claw Shield. The Lion-O Statue measures 27” tall from the bottom of the clawed base to the tip of his sword. As Lord of the ThunderCats, the polystone Lion-O Statue has a sculpted Thunderian physique, thoroughly detailed with fur-like texture. He has a fierce portrait inspired by his classic cartoon appearance, complete with feline facial features, red eyes, and flowing scarlet hair. Lion-O’s costume has been given an updated aesthetic for Sideshow’s ThunderCats collection. He is wearing two-toned blue armor accented with silver studs, along with a matching vambrace and boots. His chest bears the iconic Eye of Thundera, which can also be seen on the hilt of the Sword of Omens.